On one side we have two brilliant strategists and great team leaders, and on the other side there's a telegenic spokes-model and a semi-senile dinosaur. And unfortunately for all of us, the great leaders are competing for bragging rights about a kids' game, while the bozos are fumbling and bumbling and humbugging our world into oblivion. The Lakers draft Kobe Bryant. 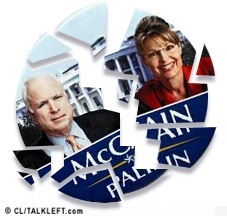 McCain drafts Sarah Palin. Obama drafts Larry Summers. McCain and Obama are idiots! All we have to do is make sucking up to the fans the only qualification for coaching, with the proviso that none of the candidates has any kind of record as a coach, or even as a player. "You/We are the ones we/you were waiting for!" And if you subtracted sucking up to the fans from McCain and Obama, both those clowns would disappear, like smoke blown away from a mirror. In short, McCain entered this election season being the worst thing that anyone can be, in the eyes of the Rove-school Republicans: Different. Independent. His own man. He exited the campaign on his knees, all his dignity gone, having handed the White House to the hated liberals after spending the last months of the race with numb-nuts Sarah Palin on his arm and Karl Rove's c*ck in his mouth. Even if you wanted to vote for him, you didn't know who you were voting for. The old McCain? The new McCain? Neither? Both? Ana Marie Cox has an extensive interview in the Daily Beast with Steve Schmidt, the chief strategist of John McCain's campaign. When he knew McCain would lose? September 29. Lots of good quotes here -- on leaks, on Palin and more. Newsweek reports, using McCain campaign sources, that Sarah Palin was, contrary to her denials, not only fully involved in her clothing expenditures, she spent far more than previously announced. NEWSWEEK has also learned that Palin's shopping spree at high-end department stores was more extensive than previously reported. While publicly supporting Palin, McCain's top advisers privately fumed at what they regarded as her outrageous profligacy. One senior aide said that Nicolle Wallace had told Palin to buy three suits for the convention and hire a stylist. But instead, the vice presidential nominee began buying for herself and her family—clothes and accessories from top stores such as Saks Fifth Avenue and Neiman Marcus. According to two knowledgeable sources, a vast majority of the clothes were bought by a wealthy donor, who was shocked when he got the bill. 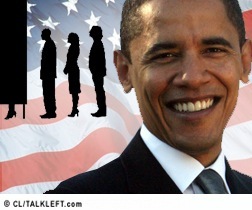 I don't want to interrupt the Obama celebration tonight with talk about McCain and Gov. Sarah Palin, so I'm starting this post early. I'm so glad she will be going back to Alaska and I won't have to write about her any more. 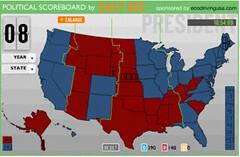 Markos of Daily Kos gives his electoral vote predictions. He thinks Obama will win 390 to 148. A lot of eyes will be on Virginia tomorrow. Today, a federal judge rejected a lawsuit by the NAACP to extend voting hours. The lawsuit, filed last week, contends that the state is violating the U.S. and state constitutions by not providing enough voting machines, poll workers and polling places, particularly in precincts with large minority populations. The shortages could result in long lines and lost votes, the suit says. "We are urging all voters to stand in line," NAACP President Ben Jealous said after the ruling. "Americans have waited 230 years for this -- a multi-gender, multi-generational, multiracial [campaign]. This is a big day. Stay in line." Disabled and elederly voters can vote curbside. And anyone in line at 7pm when the polls close will get to vote. There are more than 5 million registered voters in the state. If the John McCain of 2000 saw today's counterpart, he wouldn't recognize himself. McCain is no longer a GOP maverick, or the war hero whose principles were unwavering. He has flip-flopped on issues ranging from tax cuts to torture in an effort to win over the conservative base of his party. He has waged a dismal campaign based on fear and divisiveness. “The conviction of Al Bahlul is yet another example of a military commission system set up to produce convictions, not to deliver real justice. Unfortunately, because the system is fundamentally flawed and lacks any semblance of due process, a cloud of illegitimacy hangs over this verdict. The world deserves better than that from America. The next president should close Guantánamo and future prosecutions should occur in criminal or military courts where the Constitution still means something and where verdicts, no matter what they are, can be trusted.” ...The ACLU calls on the next president to close Guantánamo, ban torture and end extraordinary rendition.